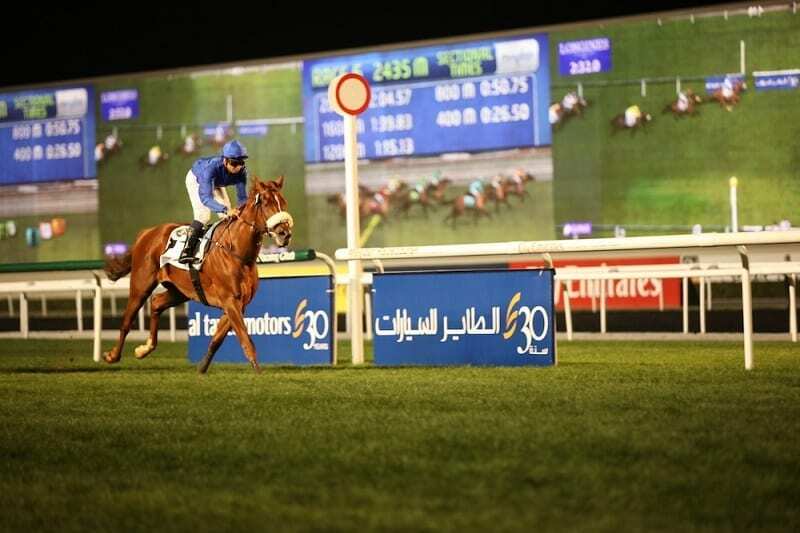 Friday’s third Al Ain meeting of the current campaign was highlighted by the final event of seven, a 2000m handicap and one that will always remain very special to local trainer Helal Al Alawi who saddled his 100th career winner courtesy of Da’Areen who won fairly comfortably under Richard Mullen. Riding for Sheikh Mansour bin Zayed Al Nahyan, Mullen settled his mount in the middle of the 14 runners, seemingly seeking as much cover as possible and, as the runners started to emerge from the final bend, they looked the most likely winner with the jockey yet to move whereas most of the opposition looked either beaten or in trouble. The pair cruised into contention early in the straight, and once Mullen committed for home, soon had the race won with Da’Areen registering a fifth local and career win, as well as his second on a dirt surface having also won at Al Ain over 1600m in January. Emirati Al Alawi, who trains from The Royal Stables in Al Ain, celebrated a career best 32 winners last season while this was number seven for this campaign and a very special one. “We are a small yard but an ambitious one,” he said. “Obviously any landmark is special but achieving this one in Al Ain with a horse owned by Sheikh Mansour is ideal. This horse ran very well when third on his seasonal debut at Sharjah and we were very hopeful today. The jockey has given him a great ride and this is a very special moment for the whole team at The National Stables. The only Thoroughbred race on the card, a 1000m handicap, was an absolute thriller with more than half of the 15 runners still in serious contention entering the final 200m. If not in front throughout, with the runners spread right across the track, Eqleem was certainly always to the fore down the centre and, having quickened clear 300m out, was able to hang on grimly. He needed to be gutsy though with Paranormal, before Guernsey and Archaic, then finally Iftitah, all throwing down serious challenges close home. On the line, Eqleem prevailed by a head from Archaic. Ridden by Ben Curtis for Musabbeh Al Mheiri, who also saddled runner-up Archaic, Eqleem was having his first start for the yard and second in the ownership of Ahmad Ghalita Almheiri. Probably last of the 15 runners with 1200m remaining, Burj Al Reef snatched what appeared a most unlikely victory in the opening 2000m handicap, powering home down the straight under Fernando Jara to lead in the final 75m. Trained by Ahmed Al Mehairbi, the 6-year-old was losing his maiden tag at the 12th attempt and clearly relished the stamina test afforded by this 2000m trip. To land the spoils, he and Jara pounced on MH Areeb who seemed less than impressed and took a bite at his vanquishers before trying, to no avail, to regain the lead. Royston Ffrench always appeared confident aboard JAP Muwalk in a 1000m maiden and the pair duly ran out comfortable winners, providing second victories of the season, both at Al Ain, for owner Sheikh Saeed bin Maktoum Al Maktoum and trainer Irfan Ellahi. Having just his fourth career start, after three outings at Sharjah, the best of which was a debut second over 1200m, the 4-year-old was much too good on this occasion, his second run of the campaign and delighted his trainer. Fresh from a Meydan double on Thursday evening, Sam Hitchcott rode Safin Al Reef with supreme confidence throughout the first 1800m maiden, happy to bide his time at the back of the main pack before electing to weave between rivals throughout the straight. The duo hit the front with about 150m to run and were never going to be denied, providing both owner, Al Ajban Stables and trainer, Abdallah Al Hammadi, their first winners of the season. Half an hour later a second maiden over the same 1800m was turned into a procession by Reeh Al Janoob, sent straight to the front by Bernardo Pinheiro. With the jockey, riding his fifth UAE winner and first this season, sat motionless entering the sweeping home bend, it was soon apparent he had all the opposition in trouble and once asked, Reeh Al Janoob skipped clear to open her account at the third attempt. Unraced before this season, the 4-year-old filly, a first winner this season for trainer Khalifa Al Neyadi, provided owners Emirates Bred Syndicate with their second ever victory. The Al Asayl team of His Highness Sheikh Khalifa bin Zayed Al Nahyan and Eric Lemartinel rarely leave Al Ain without at least one victory and their debutant Ebhaar, who may not have been the fastest out of the starting stalls, certainly was in the final 100m, sweeping around most of the field from his wide draw to land a 1600m maiden for Fabrice Veron. Departing from the outside stall of 15, he was given plenty of time to find his stride by Veron who only asked his mount to close at the top of the straight. The progress was relentless with the pair hitting the front close home to post a relatively comfortable success.